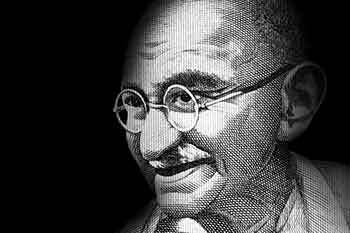 As we prepare to celebrate the 150th birth anniversary of Mahatma Gandhi, we look at some key lessons from his life that we can adopt in our investment behavior. Throughout his life, Mahatma Gandhi, lovingly called the Father of the Nation or Bapu, strived to find ways to end India’s poverty and other socio-economic issues. His emphasis on Swadeshi and non-cooperation were based on the principle of economic self-sufficiency. After all, the Mahatma was born in a Baniya family, which has been rooted in traditional Indian business ethos for centuries. It needs no reiteration that Gandhiji was astute, to say the least. Behind his peaceful and calm exterior, there was a mind that was constantly weighing and balancing options as India succeeded in gradually pushing the British to a corner. This is especially true if you are getting into investments for the long term. There is a feeling of laziness that normally creeps in, and we prefer to put off investment decisions for a future date. This is a cardinal error. Even if you start small, it is ok, just like the independence struggle where Gandhiji began all freedom movements on a small scale at first and then the nation marched on to join him. Remember that it is more important that you start. A moderately good idea in motion will move much farther than an excellent idea that is still on paper. The Civil Disobedience Movement did not yield any results in the short term nor did any other movements during the long freedom struggle. However, in the end, it created a model that forced the British to hand over the reins of the nation and leave India in 1947. In the markets as well, the longer your time frame of investment and the greater your patience, the more is the risk you can take over the period. Further, equity investments generally yield the best results over a long term. Hence, it makes sense to invest for the long term and avoid a myopic vision. Gandhiji was against spending too much time on debate and that was evident in the way he would operate, both within and without. He was a man of action and a great pragmatist. He knew that behind all the ideals there was room for practical solutions. That was only possible if we got down to action. This is what we need to become as investors: people of action. Start today because what you do today (or how much you invest today) is a lot more important that what you can do tomorrow. Anyone could have crumbled under the pressure that Gandhiji was subjected to. But, Bapu was a force to reckon with. How he single-handedly and non-violently spearheaded revolutions despite the unfavourable conditions he was subjected to shows that he had exemplary mental strength and resilience. We have seen the best of investors get overwhelmed by market panic and uncertainty. This is where a calm and composed mind is a lot more useful. Skill and talent in investing can help you to an extent, but beyond that, it is your mental mettle that matters. Mahatma Gandhi not only pushed the people around him but also pushed himself to the limits of endurance, which is what made his greatest achievement possible. He often said “A man is but the product of his thoughts; what he thinks, he becomes.” Gandhiji always believed that India would be free one day, and he lived to see the day. When it comes to investments, a lot rests on self-belief. If you think that you could be a billionaire, you will get pretty close. Of course, if you just give up and wait for things to happen, nothing much will come out of it. Gandhiji always said “There is nothing that wastes the body like worry” and that one should live as if today was the last day to live. He always stressed on the curiosity to learn. In the markets too, you must ensure that you don’t worry about short-term fluctuations and be ready to think on your feet. At the same time, take every mistake as a learning opportunity and stay updated with recent knowledge to make timely investments and reap maximum returns. The same lesson can be drawn to investing. Remember the old saying: the market is always smarter than you. This is a basic lesson in humility. It happens so often that the best of strategies go kaput, and you end up in losses. If you can be humble enough to accept that you and your strategies are fallible, then you have a chance to improve yourself. In the process an investment outperformance could be yours for the taking. Further, always rely on your own research and not “tips” that you receive from random sources. There is no easy way to build wealth and such ill-intentioned recommendations may wipe off your savings. Bapu always emphasized that one should only buy and consume based on one’s needs. Quoting one of his popular sayings, “There is a sufficiency in the world for man's need but not for man's greed.” It is important to exit the market when your target is met rather than getting greedy and making buys based on herd mentality. Gandhiji often said, “The weak can never forgive. Forgiveness is the attribute of the strong. He regarded forgiveness as a strength and said that freedom is not worth having if there is no freedom to make mistakes. In the same way, we must remember to forgive ourselves if we happen to make investment blunders. It is best to move on from an unpleasant experience and not develop a bias in our investment approach.